Indian Food Rocks: Innovative or Just Plain Dumb? Murukus! Who doesn't like these? 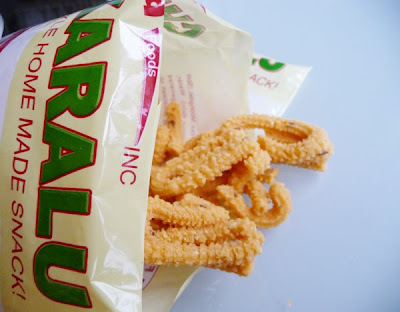 They are a crunchy deep-fried snack that goes so well with tea, coffee and even cocktails. Yum! Yum! Yum! Right? 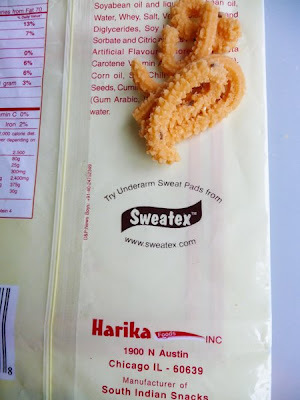 Soon after I emptied the yummies into an air-tight container, something on the back of the packet caught my eye. Never mind what it says about the marketing skills of the distributors of this product, what does it say about what they think about their customers: Stinky! And, I can't eat these anymore. Whenever I see murukus, I am engulfed by the putrid smell of sweat. I also see sweat-laden pads. Oh come on Manisha you won't give up Murukku for that! See the ad only warns you that after eating those you will need to sweat out. Then you will need the pads. Hee heee.....Their thinking goes a long way....LOL. LOL! Thanks for being so generous and sharing it Manisha, now it will haunt us as well. Ha ha ha. LOL! you have a sharp eye! They must have given up on forming them into coils too, but I had no idea they could be used in place of deodorant! Thanks for the tip! Will try right soon. Innovative idea, but a plain dumb ad. They could have advertised another product. Hard to gross me out... or my family. We can talk of all kinds of things over dinner without needing to leave. Can be fun when eating with someone who is easily grossed. How did they convince them to put that ad on a food item? I think it's more weird than gross.